Part I Principles and Techniques. 1 Interventional Cardiology Training (Carlo Di Mario and Joseph Babb). 2 Atherogenesis and Inflammation (Giuseppe Sangiorgi, Alessandro Mauriello, Santi Trimarchi, Elena Bonanno, and Luigi Giusto Spagnoli). 3 The Essentials of Vascular Access and Closure (Ted Feldman and Gerald Yong). 4 Optimal Angiographic Views for Coronary Angioplasty (Carl Schultz and Carlo Di Mario). 5 Material Selection (Carl Schultz, Rohit Khurana, and Carlo Di Mario). 6 Physiologic Assessment in the Cardiac Catheterization Laboratory (Narbeh Melikian and Martyn R. Thomas). 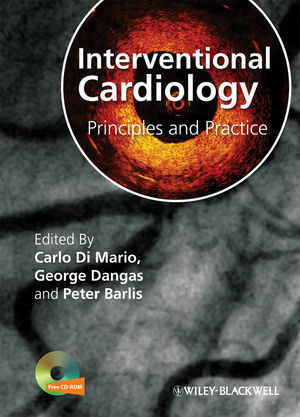 7 Quantitative Coronary and Vascular Angiography (Joan C. Tuinenburg, Gerhard Koning, and Johan H.C. Reiber). 8 Oral Antiplatelet Agents in PCI (Germano Di Sciascio). 9 Heparin, LMWH, GIIb/IIIa, and Direct Thrombin Inhibitors (Eric Heller and George D. Dangas). Part III Complementary Imaging Techniques. 10 Intravascular Ultrasound: Principles, Image Interpretation, and Clinical Applications (Adriano Caixeta, Akiko Maehara, and Gary S. Mintz). 11 Principles of Intra-coronary Optical Coherence Tomography (Peter Barlis, Jun Tanigawa, Patrick W. Serruys and Evelyn Regar). 12 Multislice Computed Tomography of Coronary Arteries (Francesca Pugliese and Pim J. de Feyter). 13 Cardiac Magnetic Resonance Imaging (Amgad N. Makaryus and Steven D. Wolff). Part IV Indications in Acute and Chronic Syndromes. 14 Stable Angina (Abhiram Prasad and Bernard J. Gersh). 15 Indications in Acute Coronary Syndromes Without ST Elevation (NSTE-ACS) (Christian W. Hamm and Albrecht Elsaesser). 16 Primary and Rescue PCI in Acute Myocardial Infarction (Neil Swanson and Anthony Gershlick). Part V Approaching Complex Coronary Interventions. 17 Chronic Total Coronary Occlusion (Gerald S. Werner). 18 Percutaneous Coronary Intervention in Unprotected Left Main (Alaide Chieffo, Valeria Magni, and Antonio Colombo). 19 Bifurcation Lesions (Leif Thuesen). 20 Approach to Multivessel Coronary Artery Disease (Bryan P. Yan, Andrew E. Ajani, and David J. Clark). 21 Rotational Atherectomy (Saidi A. Mohiddin and Martin T. Rothman). 22 Thrombectomy and Embolic Protection (William van Gaal and Adrian Banning). 23 Carotid Artery Angioplasty and Stenting (Alberto Cremonesi, Shane Gieowarsingh, Estêvão C. de Campos Martins, and Fausto Castriota). 24 Aortic Valve Disease Interventions (Srinivas Iyengar and Martin B. Leon). 25 Transseptal Puncture (Alec Vahanian, Dominique Himbert, and Eric Brochet). 26 Alcohol Septal Ablation for Hypertrophic Obstructive Cardiomyopathy (Amir-Ali Fassa and Ulrich Sigwart). 27 Cell Therapy (Zoë Astroulakis, Alex Sirker, and Jonathan M. Hill). 28 No Reflow (Azeem Latib and Flavio Airoldi). 29 The Management of Cardiogenic Shock (John Edmond and Andreas Baumbach). 30 In-stent Restenosis in the DES Era (Jiro Aoki, Adriano Caixeta, George Dangas, and Roxana Mehran). 31 Renal Insufficiency and the Impact of Contrast Agents (Carlo Briguori). 32 Coronary Artery Dissections and Perforations (Adriano Caixeta, Eugenia Nikolsky, Alexandra J. Lansky, Roxana Mehran, and George Dangas). 33 Statistical Essentials in the Design and Analysis of Clinical Trials (Stuart J. Pocock). 34 Sirolimus and Paclitaxel Eluting Stent Clinical Studies (Ajay J. Kirtane, Adriano Caixeta, Philippe Généreux, Rikesh Patel, Jeffrey W. Moses). 35 Zotarolimus Eluting Stent Clinical Studies (William Wijns and Marco Valgimigli). 36 Everolimus Eluting Coronary Stents: Clinical Trials (Neville Kukreja, Yoshinobu Onuma, and Patrick W. Serruys). 37 Novel Drug Eluting Stent Systems (Adriano Caixeta, George Dangas, Martin B. Leon, and Alexandre Abizaid). 38 Illustrative Cases (Francesca Del Furia, Giuseppe Ferrante, Pawel Tyczynski, and Carlo Di Mario).